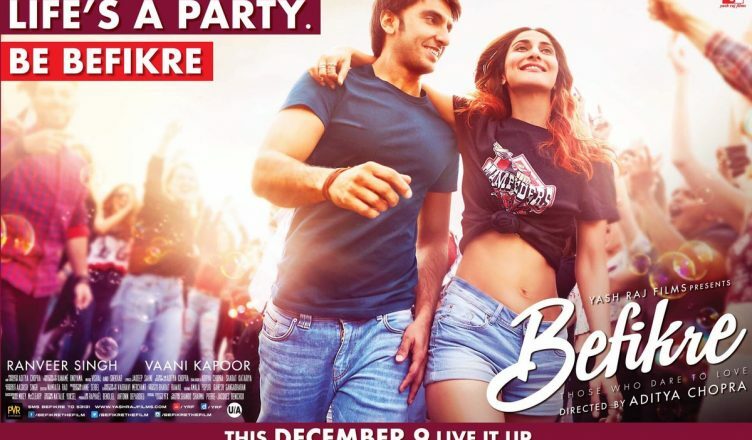 WILL BEFIKRE BE ADITYA CHOPRA’S 4TH CONSECUTIVE HIT? Aditya Chopra directs films very rarely but when he does, one can’t help but sit up and notice. He’s just 3 films old as a director and yet he’s one of the greatest directors of our times. His first film Dilwale Dulhania Le Jayenge is unforgettable and still running in theatres. His 2nd and 3rd film (Mohabbatein and Rab Ne Bana Di Jodi) are good although not as a legendary as the first film. But he has carved a niche. And that’s precisely the reason why his 4th directorial venture, Befikre, that releases tomorrow is keenly awaited. Befikre stars Ranveer Singh and Vaani Kapoor. Set in Paris, it’s about a couple in a casual relationship. The promotions kick started long ago when the first look featuring both of them kissing came out. Many posters then came out and each featured Ranveer and Vaani kissing. It made it clear what the film is all about. The trailer disappointed many as it has no traditional Aditya Chopra touch. Instead, the film seems naughty. Many compared it with Neal N Nikki, a 11 year old YRF fare that proved to be a disappointment. Despite the challenges, Befikre has a chance. It has 2 open weeks. Its cost reportedly is reasonable and hence, it can earn a lot of moolah. Obviously, the film won’t be blockbuster as it’s a semi-adult film due to which the family audience would stay away. Also, the response has to be positive. Or else, Befikre can have a fall from Day 4. But if all goes well, Befikre can set the box office on fire and have a dream run till the release of Dangal on December 23! WOULD YOU LIKE TO SEE DANGAL AND WHY? DO LET ME KNOW!